The Guide “Vinitaltour- from producers to importers” aims to present the Italian wineries and their wines to international importers. VINITALTOUR, which stands for “Vini Italiani in tour” (Italian wines on tour), puts on stage the great range of Italian and local wines as in a real journey with a different destination every four months, looking for new wineries and new products. Our task as editors is to provide each importer-reader and in an easier way, information on products and firms from which they can choose the most adapted for their own commercial project. 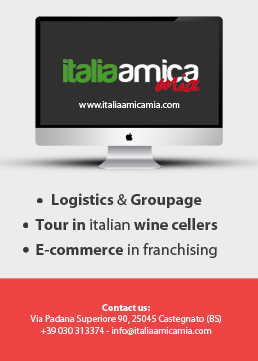 Importers receive information in detail on the variety of wines in our Belpaese and on the selling products of the diverse wineries set in different regions (list of selling products, yearly availabilities and a reference price for each labels). Thus importers will be able to get and keep in touch directly with the firms, with no intermediary in order to get more favourable commercial terms and conditions. The mission of this Guide is to build a direct connection importers-producers in order to cut the distribution chain as much as possible and optimise prices, logistic costs and margins, both of importers and producers. Our publishing project includes three outputs of “Vinitaltour” which will offer more and more new wines and will show wineries from all over Italy. Each number of this Guide will reach almost 9.000 importers from all over the world through email. We wish this Guide will meet your expectations and we hope our readers will enjoy it!